Reflections for Sergeant Noel Ramirez-Beltran, Jr. I never got the Honor to work with you but everytime I did see ya, you had me laughing man. You are a good man, father, husband and friend. You guys are missed very much every day. I wish I could go back and change that day. Enjoy Heaven my Brother until we all can meet again. You have been missed by all and you are in my thoughts and prayers daily. God bless. Rest in peace Sergeant Ramirez. SGT. Ramirez there are not any words to say that expresses how much you are missed. You were my first SGT when I got off of FTO and we would sit running traffic together and just talk till it was time for me to go home and you to go to the gym. I will never forget the stuff I learned from you and wished we had more time for talks. Rest easy brother. I wish I knew what to say that would not only describe my feelings, but those of our agencies (Levy County & Gilchrist County), and the citizens that make up these blessed communities. The impact you have had on the lives you touched has shown like a light in a dark tunnel. The out poor of support and gratitude shown to the brothers and sisters you both worked side by side with has been overwhelmingly amazing. Sgt. Ramirez you truly one of a kind, and no one can compare to the personality God had given you. I can't think of one time I have ever seen you without that smile, and carefree attitude. You enjoyed life, and honestly strove to be the best Deputy, Investigator, Sergeant, and friend. I am beyond grateful that I had the opportunity to work along side of you during your career at Levy. I remember the first night I met you. I was with Sgt. Houchin completing my FTO training. Sgt. Houchin and I were parked across from the Olive Drive BP. As were going over certain laws and him answering the questions I had you pull in, park, and we all get out. You immediately walked up, stuck your hand out, and introduced yourself with a smile on your face that left an imprint on my mind. After 5 minutes of speaking I felt like I have known you my whole life. You had that gift though. You didn't meet a stranger and your personality made everyone want to like you! Thank you Sgt. Ramirez, and thank you Dep. Lindsey for your service! Enjoy paradise brothers. One day we will see each other again! I just wanted to take some time to thank my fallen brothers for their service and sacrifice, formerly residing in Gilchrist County for many years, this touches my heart dearly. Deputy Lindsey and Sgt. Ramirez are true heroes who laid down their lives to protect our community. May God Bless their family holding the thin blue line, and prayers and condolence to family and friends. " Never Good Bye, Just So long for now" RIP Brothers, We'll hold the line from here. We are so saddened send our deepest sympathy to the family and friends of Sergeant Ramirez. May the Amazing Grace of God surround and be strength for all who knew and loved him. I am sorry for your loss to the Family, Fellow Officers, and Friends. I will keep all of you in my prayers. RIP to all three of the Officers. Frank J.Corasaniti II, Retired Fire Lt.
Rest in Peace Sgt. Noel Ramirez. Thank you for your service. My thoughts and prayers are with the Ramirez Family and the Gilchrist Sheriff's Office. On behalf of the Lake Weir High School Criminal Justice Club and all of LWHS we offer our deepest condolences. On behalf of the Klamath County Sheriff's Office in Klamath Falls Oregon, we send our sincerest sympathy in the recent loss of your Sergeant, Noel Ramirez, in the line of duty. It is always a huge loss when a fellow sergeant makes the ultimate sacrifice. His bravery and courage to protect and serve your community has not gone unnoticed. Rest in peace. We have the watch from here. I was devastated and outraged when I learned of the brutal and senseless assassination of you and your partner. To the Ramirez family, fellow officers, and all who call Noel beloved , my heart goes out to all of you and may you find comfort in your loved ones and your strength in your faith. When my son was killed, the entire law enforcement community in our area embraced us in a circle of love and support, and I know you will receive the same support. It makes the unbearable less torturous, and I pray for your solace. I hope that your family knows that a nation mourned for you. We will never forget any of our heroes. This reflection is sent with the utmost respect for the dedicated service Sgt. 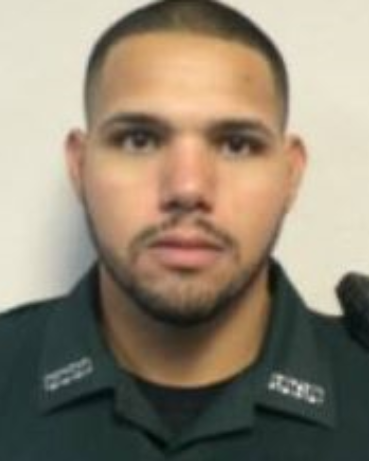 Ramirez gave to his community and the citizens of Florida and for the supreme sacrifice he and his family made on April 19, 2018. I miss you brother, you were one of the best ive worked with. Smart, funny, and always willing to help everyone over yourself. You and Taylor are missed greatly. You were a mans man, and one of the best LEO I know. Gonna miss that bright smile and joking that you often had. You made rank at Levy County Sheriff's Office as a Detective early in your career, and was proud to work with you. When you moved on to the Gilchrist County Sheriffs Office, again you made rank as a patrol sergeant quickly, as usual. You always strived to be the best and of course you were. You were taken abruptly and without a chance to defend yourself by a selfish coward. I know that if this happened to a cop like you and Taylor that it would have happened to anyone of us that day. Your service was beautiful, I'm sure you saw it from above. We miss you Bro.. Hold it down up there until our time has come. Sergeant Ramirez, thank you for your service to the citizens of Gilchrist County, FL. May the Lord comfort your family and fellow deputies of the Gilchrist County Sheriff's Department during this very difficult time. Your sacrifice will not be forgotten. Rest in Peace Sir.